Just like beautiful chess boards or chessmen, elegant and luxury chess tables are items that chess enthusiasts and collectors value highly. And fortunately, we have a number of products that can qualify as elegant and collectible chess tables. However, based on our research, here’s the Top 10 Chess Tables that we’ll recommend to our buyers right now. This simple and elegant wooden chess table, designed by no other than the legendary Frank Camaratta, is a House of Staunton offering that chess aficionados will dearly cherish. 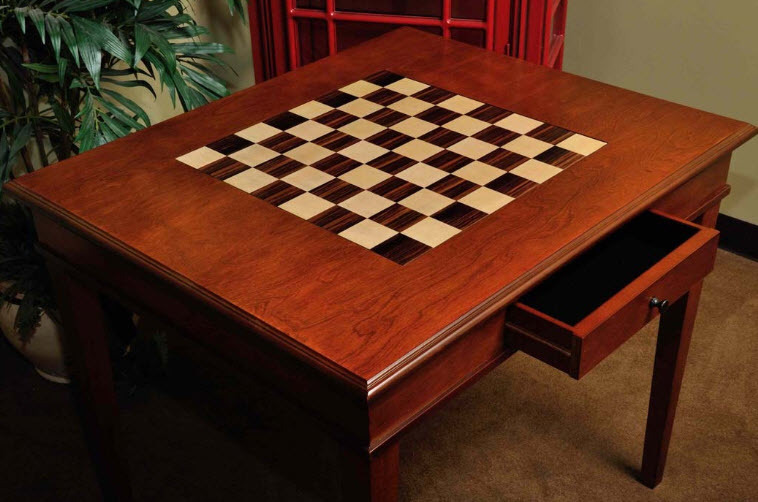 This well-proportioned chess table flaunting a transitional style will fit nicely with any décor. The surface of the table (34 by 32 inches) is generously sized for gameplay and can easily accommodate accessories such as store pads, chess timepieces, captured pieces as well as some of your favorite drink and snack items! In fact, among chess tables that come with drawers or cabinets and a large playing surface, this House of Staunton product, you’ll find in due time, is one of the best for playing serious chess. The item is made of solid mahogany and according to verified users, the product is rather heavy in weight. It also stands 30 inches off the floor. All of which makes it a rather large piece of furniture. Which, unfortunately, can be counted as the only disadvantage of this otherwise exquisite and handsome item. Since if you have a space crunch, the product may not be ideal for you. difficulty proving the authentication of the product if you ever want to resale. Apart from that, there is very little to complain about this chess table. The surface comes with a semi-gloss finish that makes the item look attractive without making it attract too much light. The playing board itself is composed of high quality Curly Maple and Rosewood alternating squares. To cap it off, the felt-lined drawer features a Frank Camaratta signature on top of the House of Staunton logo, ensuring you face no. Well, as already mentioned, the only drawback with the table is that it may be a bit too large for some spaces (one user reports that he had cut the legs of the table to make it look more like a coffee table size). Apart from that, you’ll be hard put to find any flaws with this product. And finally, at $495 (current price at Amazon), a chess table of this level of quality and craftsmanship is simply a steal! MegaChess is famous for its giant-sized chess boards, chess sets and other accessories. Many of those giant sets that you may’ve come across at places such as shopping malls, cruise ships, etc. had probably come from this world-renowned company. The current giant chess table is another proud addition to MegaChess’ already illustrious line of life-sized chess products. Conveniently enough, the table comes in two different height options : a 20″ coffee table-like height and the taller 27″ height one. The first one, supported by four life sized teak rooks, is ideal for children whereas the latter, that uses four giant bishops as its four legs, will be more convenient for adult gameplay. As for the glass top table, it is made of the finest quality tempered glass which is incredibly strong and features a permanently sandblasted etched checkerboard. In short, the sleek design of the table coupled with its mega size will be an instant eye-catcher at any home and no visitor to your place will need to second guess about your love and enthusiasm for the game of chess! Table legs weight & dimensions: Rook legs each weighing 30 lbs; height-20″, base- 13″/ Bishop legs each weighing 27 lbs; height- 27″, base- 13″. One thing that we may say against this otherwise great chess table is that the manufacturers may have included a larger border area around the main playing surface (especially considering the already huge dimensions of the glass top). Prospective buyers must also keep it mind that the item (both the table top and the giant leg pieces) are high maintenance, however this is a common issue for more or less all luxury chess tables. Save the above, the item is simply one of those chess products that will get valued for generations to come. JLP chessboards boast of a long and rich heritage of exquisitely handcrafted solid wood chessboards not only made in USA but also from locally sourced woods. Add to that the skills passed down for as long as five generations, and you’ll already start to appreciate why chess products from this brand is so highly valued by collectors. Now, in addition to their exquisite chessboards, John of JLP has come up with this Premium Hardwood Chess Table that is almost as handsome as you can imagine! The table comes in two different styles—one with a perimeter that is a blend of maple and walnut and the other entirely constructed of a maple perimeter. 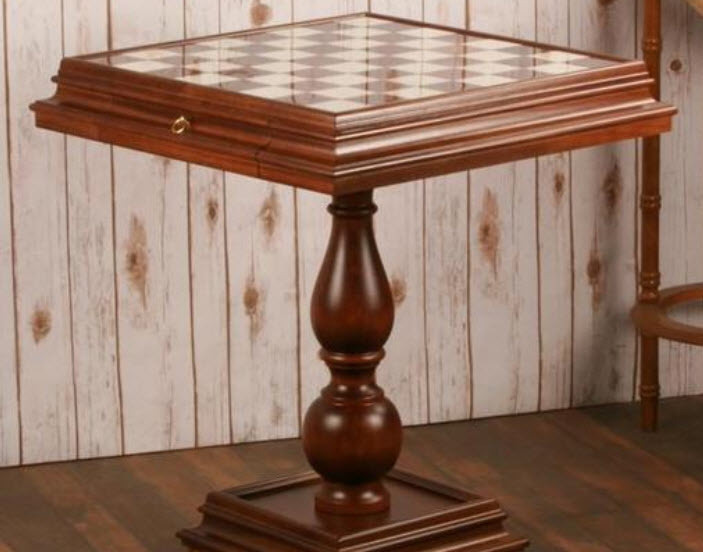 That table comes with a hole inside that is designed to fit staple 21″ JLP chessboards, although it will also accommodate a slightly larger board. A great plus with this table is that you can detach the playing board any time if you so choose. Also, the table can be bought both with and without the chessboard. The table also features an inside storage as well a spacious 4″ border for putting your chess clock and other accessories. The only inconvenience that buyers may potentially face is that they cannot fit larger than 21″ chessboards in this table. But you’ll know that anyway when you’re buying the table and if you still want to invest in it, there must be good reasons for it! Another proudly US made product that also comes with a host of advantages. 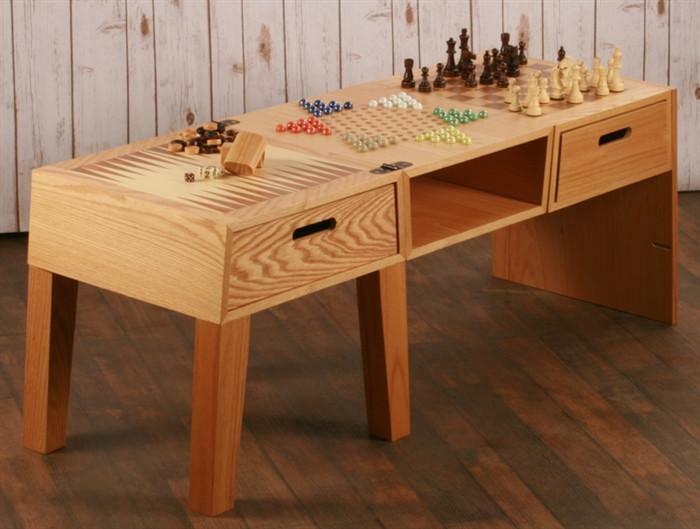 First of all, the table lets you play two other board games besides chess, namely backgammon and checkers. Secondly, unlike most chess tables, this item actually comes complete with a set of 32 Staunton chessmen (led by a 4″ king). Each of this Kari and Sheesham wood pieces are intricately designed and perfectly weighted to provide a satisfactory playing experience. Now, to come to the table itself, the round pedestal style has a classic and stately appearance and so does the rather bulky storage or wooden crate segment. All the different pieces of the table are also made from solid and sustainable cherry wood whose natural brown color will mature and adopt a richer hue with age. Another exquisite offering from the House of Staunton. A limited collector’s edition, you may want to act quick if you’ll like one of these to adorn your living or playing room. 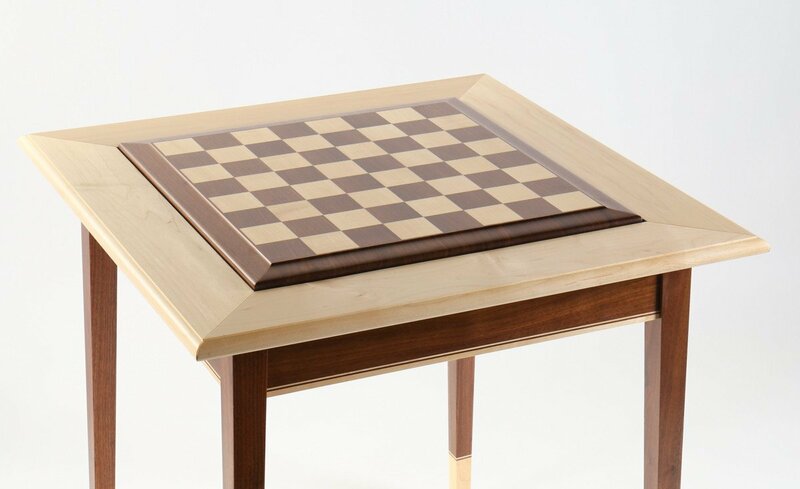 Made of an elegant Walnut top and a beautiful White Oak base, this hand-crafted table, a pet child of the master craftsman Nate Cohen (each item will feature a personally etched sign of Mr. Cohen), is a dream come true for all collectors of luxury chess items. The product will be custom designed according to your requested specifications and this includes the choice of storage compartments as well. So, you may order it with two or three drawers or with none—if you so prefer! The chess board features an exquisite combination of Brazilian Ebony and Maple squares. In short, we will say that this is the table for you, as long as the price (a whopping $4,995) is not a handicap. Another proud JLP US made product that you will appreciate as much for its elegant design as for the functional insights shown by the manufacturers of this chess table. Just like the earlier JLP product on our list, this board is equipped to fit standard 21″ JLP chessboards. There are side shelves that you can tuck in or out as you may wish. The shelves provide extra space for captured pieces, chess clock, etc., however if you are short of space, you may as well tuck them in. Just as thoughtfully, the manufacturers have provided a lever that lets you raise or lower the playing board—according to your preference. And as you can expect with JLP, the table is a combination of hard wood construction with zero veneer and high quality handmade craftsmanship that has become a hallmark of this particular brand. At 30 inches tall, the table is also of a comfortable height for seated play. If you have a thing for products Italiana, you need look no further than this handcrafted game table made from finest Italian woods. With its imposing and ornate style as well as its diverse range, this one really travels over the top and is aptly named the Ultimate! 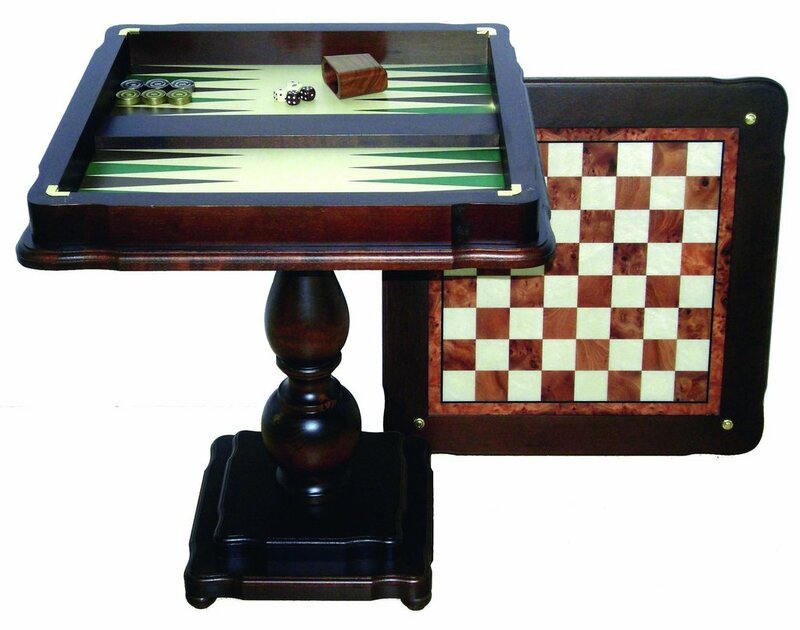 You can play chess, checkers, backgammon as well as cards on the different layers of this multi-use table. The chess and Backgammon surfaces are made of inlaid Maple and Briarwood while the table itself is made of a combination of Mahogany and Walnut. From the tabletop to the pedestal, you’ll pretty much love everything about this Italian handmade table. We like this one for its innovative and convenient design just as much for the affordable price point at which it is offered. The foldable compartments mean that you can put the table at a vertical, a horizontal or (if you remove one of the compartments) in a coffee table like arrangement—just whatever suits your present requirements. Made of hardy beech wood, the several drawers provide adequate storage for a whole host of game pieces including chess, checkers, Chinese checkers, marbles and dice. We would especially recommend this one to those with kids at home. If style and elegance are your prime preferences, we’ll suggest that you go for this one. At $1,200, it doesn’t come cheap, but you get more than your money’s worth from this finely handcrafted Italian Marble chess table. The very feel and the look of the item will inspire you to raise your game to a different level and we’re not exaggerating! Made of Italian mahogany and solid walnut and to top it all, the surface inlaid with authentic Italian marble, the board simply rivets your attention. The finely sculpted pillar that joins the table with the square base comes with an unmistakable classical appeal. And the square base itself rest upon four serried supports. This is not as giant from MegaChess as it’s an elaborate one. 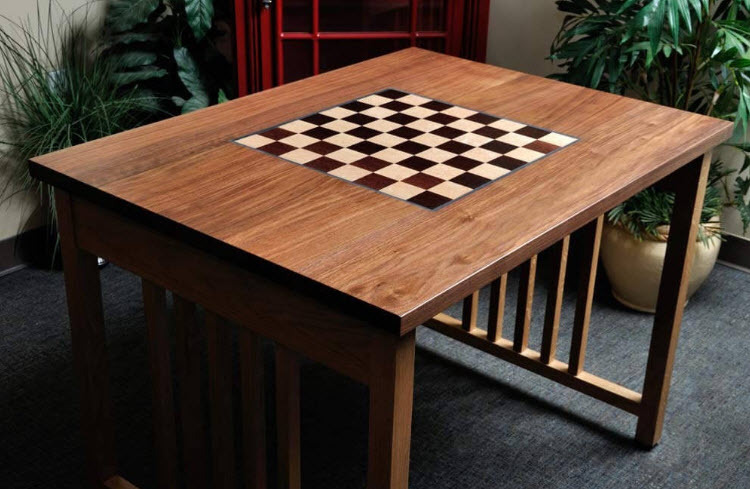 Yes, with 4″ squares, it is still pretty big, but what you’ll really appreciate about this chess table is the flexibility and the range of options it offers you. For example, the set comes complete with two round stools for seated play and yet, you can also simply detach the board and storage and lug it around outdoor for a less formal session of play. One must be no less impressed by the fact that the entire item is made of high quality Indonesian teak that underwent a kiln-dried process for two entire years before the craftsmen started to work on the wood to make the table! A quite imposing testimony as to the quality of the item and the care the manufacturers have undertaken to ensure that you get the best value for your money. Do also remember that this stunning chess table is available in two color options. The light stain is the staple item whereas you’ll need to place a special order for a dark stain finish. A wooden chess table just has that classic look that people think of when envisioning chess being played. Wood looks good, but is usually still very affordable. The different wood types and stains can add color to pieces as well. Perhaps the only real drawback of wooden tables is that food and drink should be avoided as much as possible when playing. Wood is the easiest type of material to warp if wet. Popular wood materials include walnut, mahogany, teak, rosewood and maple. Wood tables are usually finished, but the unfinished look is rising in popularity for a different type of look. Out of all the different types of material, stone might be the most versatile. That is because a lot of stone tables can be used indoors and outdoors. In fact, street chess is almost always played on some type of stone table. Stone tables can be affordable, but more expensive materials can drive the price up quite a bit. Stone is nearly impossible to mess up, so buying a very nice set can truly last a lifetime. Most stone chess sets are not built for portability, since they are a little heavier than most materials. The most popular materials used for chess tables include marble, onyx and alabaster. There is something about that sheen and shine with metal that makes people gravitate towards these chess tables. The overall look and feel just screams high class, even though some tables can actually be extremely affordable. Metal tables tend to run a little heavy, which adds stability during play. Like stone though, it is not recommended to use metal sets consistently during travel. Some metals can show age quickly if played on frequently. Anything from body oils to the elements can age metal faster than other materials. For collector tables, it might be best to only use sparingly. Obviously, the price of metal can vary quite a bit. Some of the most expensive sets in the world use brass, silver and gold, which can be extremely costly. The typical metal board will use cheaper materials. Like stone, glass is a material seen a lot in when it comes to expensive chess sets. The right glass set can have that sleek, modern look that can catch just as much attention displayed as it can during play. Glass sets are not recommended for anyone who plans on traveling or moving their setup around. Since most glass boards also come with glass pieces, there are just too many fragile parts to risk breaking. Out of all the materials, glass sets should be handled with the most care overall. With that being said, most manufacturers use glass that is durable enough to be played with on a consistent basis. Just don’t be reckless around it. If affordability is the #1 priority, it is hard to go wrong with a chess board made out of plastic. This can usually be found for a very low price, since plastic sets are cheap and easy to mass produce. The downfall, of course, is that they might not have the durability of some other sets. Although plastic has a cheap reputation, some themed chess boards actually use plastic because it allows for a lot of creativity. There are different levels of plastic quality, so keep that in mind while shopping. Another advantage of plastic is that it is the perfect material for smaller children. If something bad does happen to the table or pieces, it can easily be replaced. There is a reason why nearly every single themed chess set geared towards children use plastic materials. Chess might be an old game that dates back centuries, but that doesn’t mean a table and set can’t look great with a modern look. More and more people who are tired of the same type of designs will opt for a modern take on a classic game. These chess tables usually follow a pattern of using a sleek, minimalist board with modern or even futuristic looking pieces. This style is popular enough that there are modern tables in many different materials, sizes and more. Chess is an old game, so an antique look is always going to look classy. It can be a fun experience shopping for antique chess tables that are either brand new or used. Shopping for a brand new, antique look all comes down to personal preference. The style is similar, but most of the times, materials have improved. As for used, vintage tables, always examine them before purchasing. No matter how good one looks, it is important to make sure there are no issues with it. A lot of antique chess sets stick to wood, glass, stone or metal materials. Very rarely will a plastic set be found, unless it was a themed set that isn’t particularly old. The possibilities are pretty endless when it comes to unique chess tables. There are so many different and creative ways to make a table, just as long as it still has that same 8×8 grid. 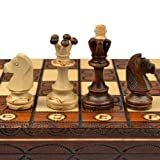 Unique chess boards can be found online, or custom made. Any material can be used, and the size range is obviously up to the customer. Small chess tables are great for a variety of reasons. For starters, they tend to be the most affordable. Most chess players buy a small table at first before graduating to something bigger and more expensive. Smaller tables are also extremely portable. Chess can be a complicated game to pick up and go, but the smaller the set is, the easier the process is. Good luck packing a large chess set on an airplane. A medium sized chess set is versatile. It can be played virtually anywhere, and the majority of chess sets come in this size. Since so many manufacturers try to target the medium sized tables, there are more design options available to pick from. Medium is synonymous with standard chess board size, and in general, boards will hover around two feet in width and length. This is a manageable size for two players that doesn’t take up a ton of extra space. Larger tables are really meant to be part of a room setup on a permanent basis. A lot of people who are very passionate about chess in general go this route. Getting the right large chess table can really be an eye catcher. The downside is these tables can be pretty costly, but they are usually very durable. Craftsmanship is of the highest quality for the most part with large tables as well. This is because those who are looking at this size are usually serious about the game and only want the best. Round chess tables, especially made of wood, tend to have that instantly recognizable vintage look. However, these days, round tables are actually available in pretty much any type of material. An advantage of a round table is that it is easy to move around and even have other people sit near the table. Instead of only having four very distinct sides, freedom of movement is there. It also appears smaller, even if it takes up pretty much the same amount of space as a square chess table. The actual chess board is a perfect square, so for many, this is the most practical chess table shape there is. A square table can perfectly frame a board, while saving space as well. Out of the three main shapes of chess tables, rectangle is the least popular. The reason being, there is just a lot of unused space. With that being said, there are still some people who prefer this look. One reason why people go with a rectangular board is that it fits a space in a home. Not only that, but some feel that square and round options don’t provide enough extra space to place captured pieces or other items. A rectangular table is most often looked at as a multipurpose type of option. 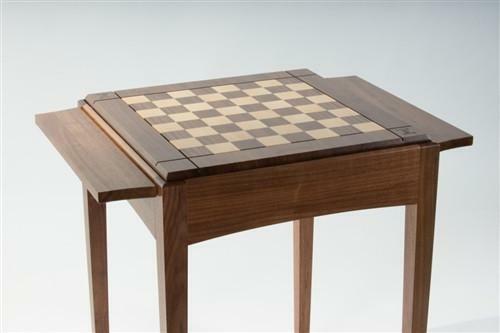 A standalone chess table is a classy, minimalistic way to play the game of chess. Most tables on the market look sharp, with ample leg room underneath for players. The legs of a standalone table can come in a variety of different designs. The single support leg is always a classic look, but it doesn’t provide the same type of stability as four legs. This is important to consider, because players who rest their arms on the table a lot might need that extra level of support to avoid an accident. The practicality of a chess table with storage below is the main reason why a lot of people end up opting for this setup. It is very important to protect pieces when not in use, to avoid misplacing or breaking them. While these tables will be bulkier than standalone tables, there are some designs that are very sleek and capable of resembling that slimmer look. 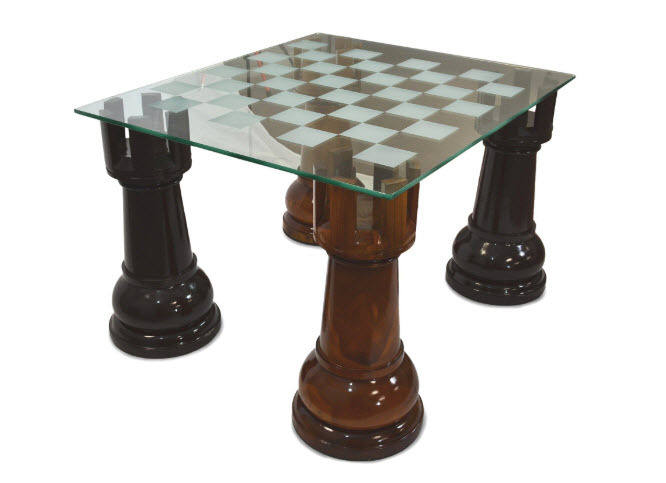 Chess house is one of the best Top Chess Table Brands. It has excellent customer support and the chess sets are reasonably priced. There is a wide variety of chess sets to choose from, and the safety packaging ensures your purchase arrives in one piece. The unique selection ensures you get value for your money as they are high-quality products. Chess house offers 100% customer satisfaction as well as fast and efficient shipping services. The easy replacement parts ensure the fun does not end when you displace one or more pieces. The package comes with a chess board, so you don’t have to worry about making extra purchases. The unique packaging makes Chess House products suitable for gifting. You could even visit the website and get gift ideas in case you don’t know what to go with. There are tournament chess sets that can be used in schools as well as chess sets you can buy for family use. This is a highly-rated online chess store that offers all regulation chess piece sizes. You can buy a basic starter chess set combo or basic club chess set to get you started. With the House of Staunton, you enjoy free shipping and fast delivery services. You get to order your favourite chess set and have it delivered to your door. It is a logical choice as it has reasonably priced chess sets. This is an old chess manufacturer that has been in the business for a long time. You get to enjoy luxury chess sets without breaking the bank. The chess sets are exceptionally well crafted, making them suitable for gifting a chess lover. These surprisingly affordable sets allow you to learn this popular game. House of Staunton chess pieces is handcrafted from luxury wood to ensure they last you a long time. This is a reputable chess store that offers themed chess sets. You can also get quality and durable plastic pieces that have a long lifespan. The clean, simple design, as well as the vivid coloring, ensure you can differentiate pieces when playing with someone. It makes one of the finest luxury chess pieces that are unequalled in quality. Some of the wood used in manufacturing the wooden pieces include; African Blackwood, Ebony, Cocobolo, and Blood Rosewood. Moreover, it offers craftsmanship you can bank on. You can also purchase DVDs and videos that help you improve your skill. There are also chess bags that ensure you keep your chess set safe from damage or loss. MegaChess offers giant chess sets that ensure you enjoy chess outdoors. There is a wide variety of sets made from different materials. You can purchase 7-inch or 12-feet chess pieces based on your preference. Some of the chess materials MegaChess offers include fibreglass, teak and plastic. Each set has complementary colors that are not only bold enough so you can differentiate them while you play, but they also ensure aesthetic appeal. You can purchase 72-inch chess pieces, the world’s largest pieces. The sets are surprisingly affordable, and you get to explore chess from a different dimension. There is also an option of renting out a chess set at an affordable price and have it returned once you are done with it. MegaChess offers chess sets for commercial and residential use. You can rent out a set and teach your students with magnified pieces. Chess USA is one of America’s largest chess stores. It features a massive collection of chess sets that allows you to get what you are looking for. There are sets in all manner of sizes that are budget friendly too. Chess USA also offers books, videos, tournament supplies and outdoor tables. You also get computer software that allows you to play on your laptop. There is a fantastic collection of chess sets that make shopping at Chess USA a fun experience. The Heirloom luxury chess boards are hand-carved to ensure you enjoy the personal touch. 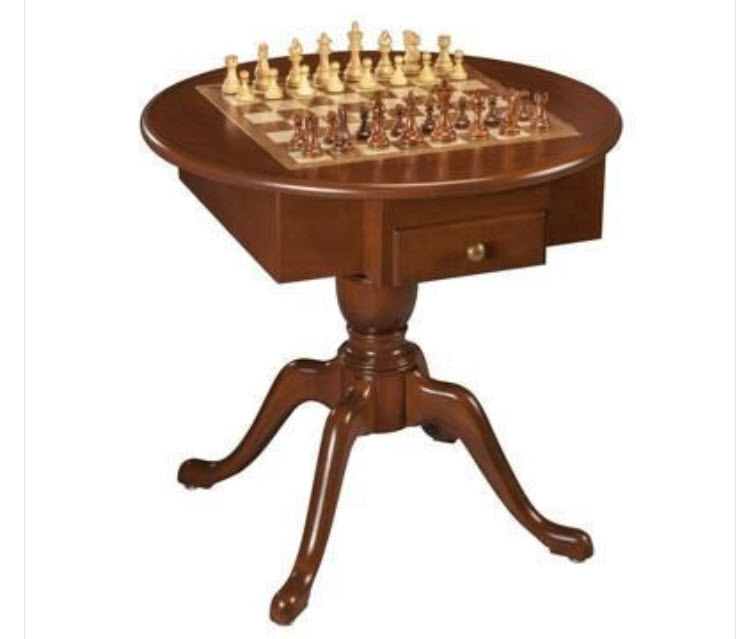 Hayneedle is an online store that offers furniture as well as chess sets. This is an affordable site that allows you to get a high-quality chess set without breaking the bank. You get to purchase desirable chess pieces that guarantee value and a long lifespan. There is a variety of colors to choose from, and the excellent customer service ensures you get assistance selecting what you need. This is a well-reputed online store that offers unmatched commitment. The chess sets are securely packaged to ensure they get to you in one piece. The excellently crafted chess sets give you the opportunity to enjoy a good game. These are durable tabletop chess sets that can be used commercially as well as residentially. The material used to make these chess sets is of high-quality, ensuring you get value for every penny you spend. World Chess Pieces is the #1 source online for finding quality chess pieces. 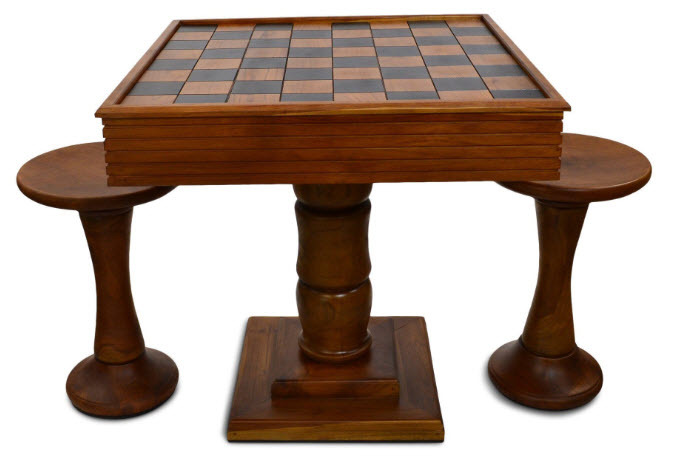 Shop via World Chess Pieces online for the best chess sets, boards and tables.